Yashin Ocean House, a modern Japanese restaurant located on Old Brompton Road, brings to London a head-to-tail type of dining similar to St John’s. Only here at Yashin Ocean the focus is seafood rather than meat. It’s a refreshing concept and beautifully done by chefs Yasuhiro Mineno, ex-head chef at Ubon by Nobu, Shinya Ikeda, ex-head chef at Yumi restaurant in London and Daniele Codini, a former chef de partie at The Fat Duck. The trio have conceived an inventive modern Japanese menu that not only brings head-to-tail ingredients of the sea world into the forefront, but combines it with glorious Western produce such as truffles and foie gras as well. The result is a lovely harmony of Eastern flavours with Western touches. 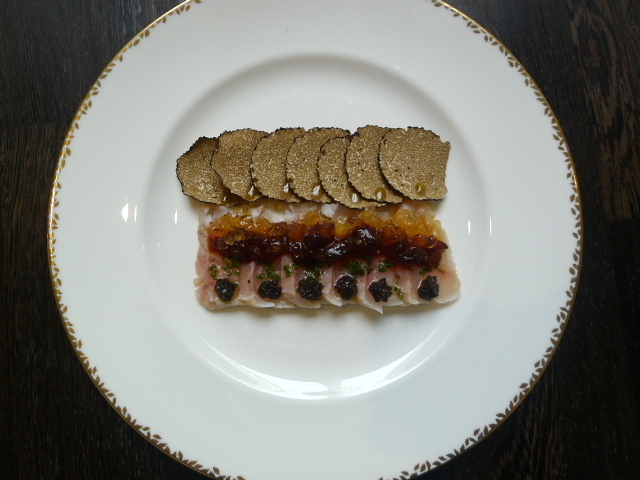 Dining at Yashin Ocean House was a pretty faultless experience with our first dish of unagi eel and summer truffle (£12) being particularly mesmerising. 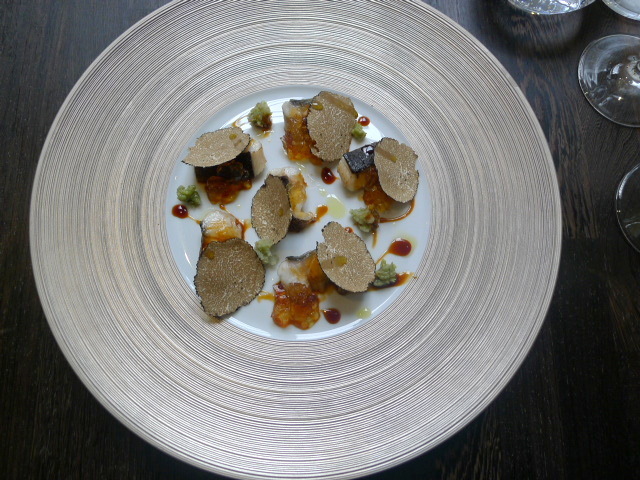 The eel was gorgeous and the truffle was fragrant and really enjoyable with the eel. 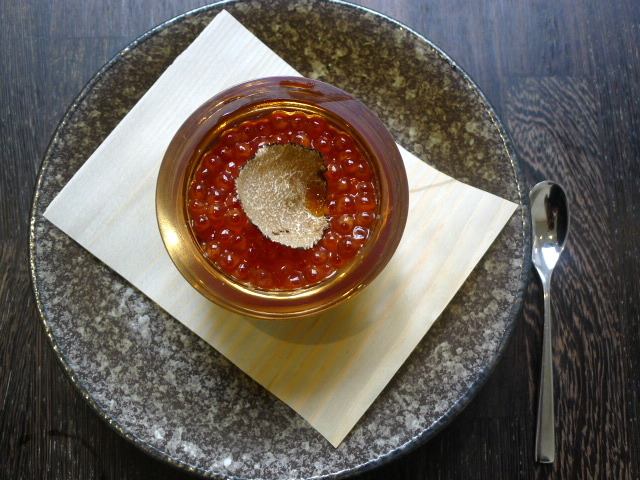 Also delectable was the delicately smoked salmon caviar (£11.80) with a light soy dressing and a shaving of truffle. 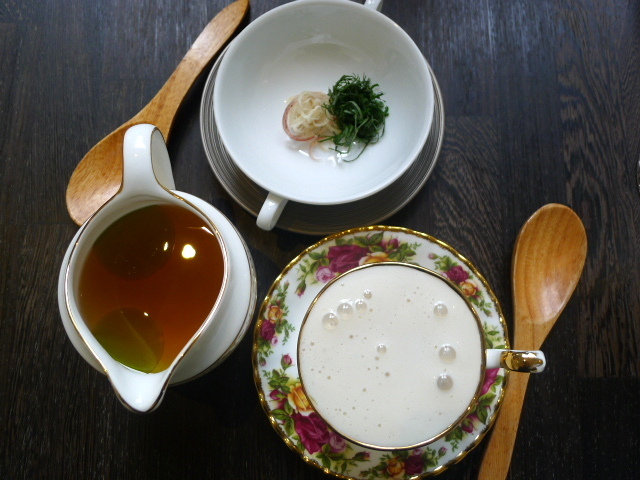 Soup offerings included a fish consommé which was intensely flavoursome. There were also some finely chopped pieces of ginger and fine slivers of fragrant shiso that helped to elevate the soup further. Also delicious was a miso cappuccino, a miso soup topped with tofu espuma (both £3.50). We tried a couple of carpaccios, the first being the grouper with summer truffle and a tosa yuzu dressing (£16). The fish was beautiful and notable for its flavour and freshness. A wagyu beef loin carpaccio with wasabi dressing (£13.50) was tender but slightly dull as more acidity was needed to bind the dish together. The omakase sushi (4 pieces – £13.50) came with tuna, sea bream, salmon, and yellow tail topped with dried tomato and Parmesan which was gorgeous. Each piece had been perfectly dressed with soy sauce by the chef so that there was no need for further saucing. 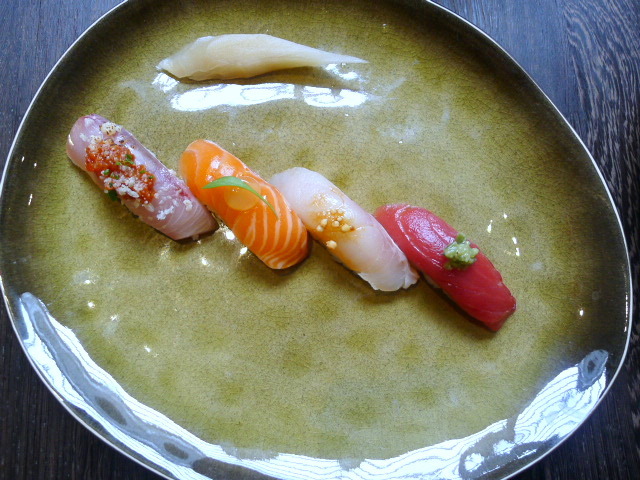 Also wonderfully fresh was the fish selection in the omakase sashimi (£16 per person). There was some beautifully fatty tuna toro with ponzu jelly, prawn with coriander sauce, razor clams with kombu, salmon and red snapper with tomato salsa. 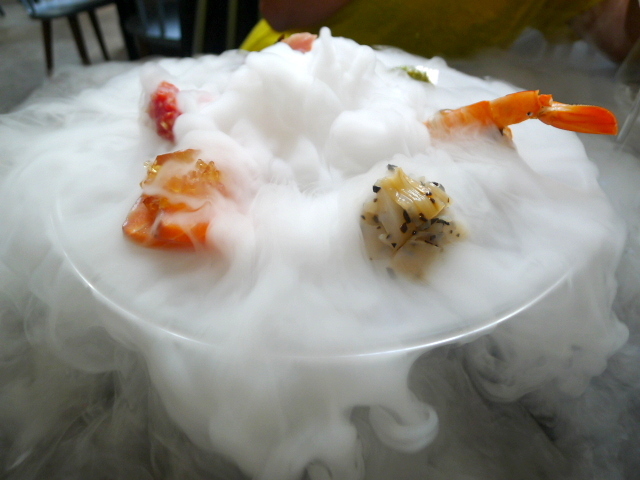 There was a touch of theatre to this dish with a ponzu liquid being poured over dry ice to produce a yuzu ‘smoke’. 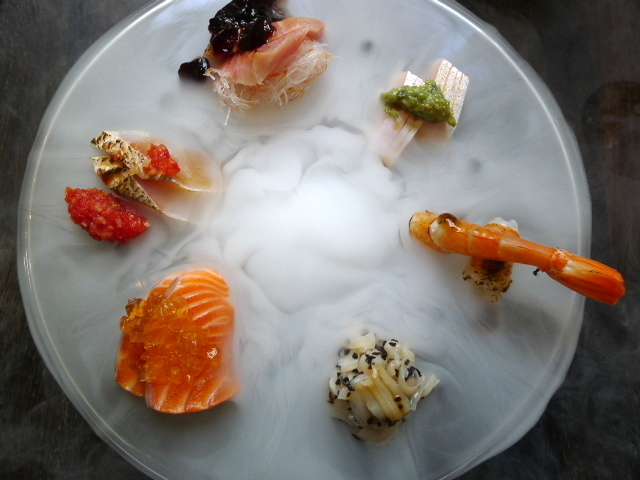 The sashimi was not only a tasty and visually arresting dish, but a wonderfully fragrant one as well. 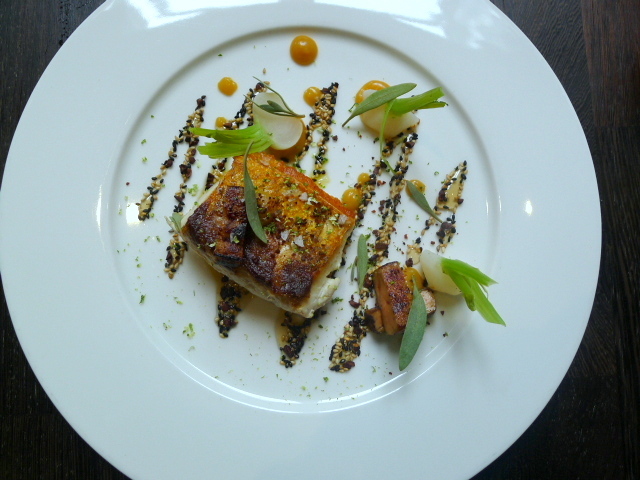 From the cooked selection, each element in a dish of homemade foie gras and Cornish wild sea bass (£29) had been perfectly prepared with the use of a yuzu miso bringing the dish together. 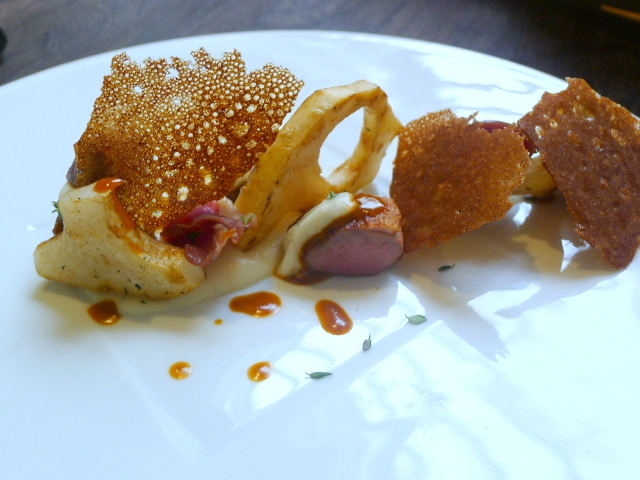 Also skillfully cooked was the duck with kohlrabi, (£24.50) although we found the pairing of the Etrille crab sauce with the duck a little peculiar. Desserts were fabulous and showed off some refined technical skills. 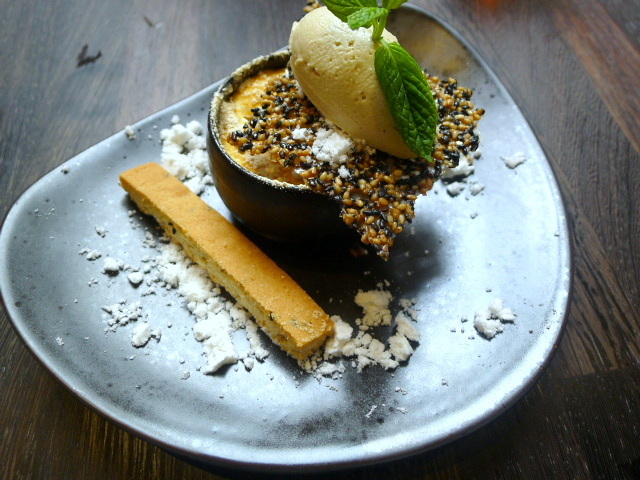 An all sesame dessert (£8.50) contained a light sesame brûlée with a crispy sesame biscuit, sesame nougatine and a creamy sesame ice cream. 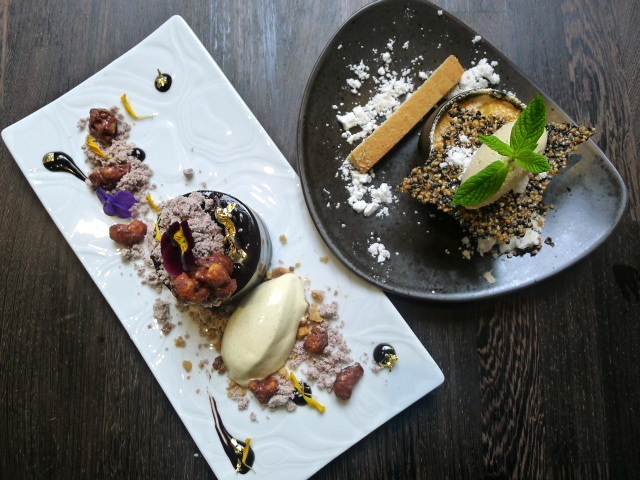 The dessert was delicious and showed off a delicate sensibility. 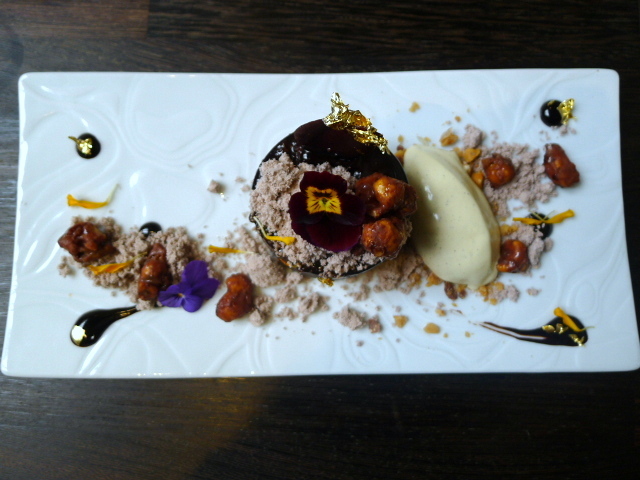 A miroir chocolate (£10) was the height of decadence, consisting of a rich and creamy vanilla and chocolate mousse coated with chocolate ganache and some crunchy hazelnuts. 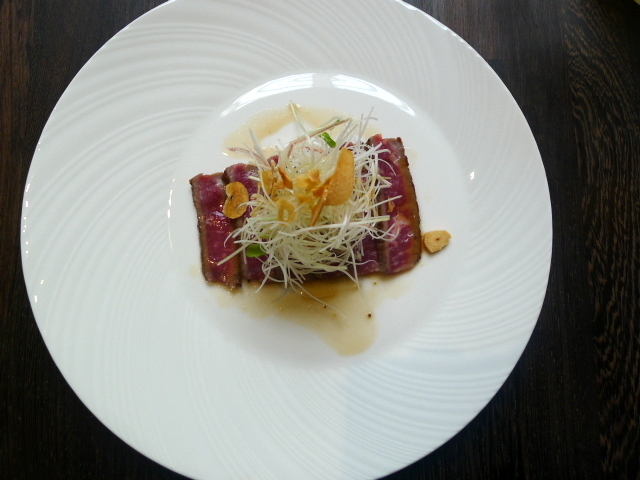 We were thoroughly taken in by the wonder of the food at Yashin Ocean House. Every element came together beautifully starting from the incredible produce to the originally conceived dishes to the highly skillful execution. The service was polished and professional although a little stiff. The décor was stylish and contemporary and created a sophisticated yet comfortable dining experience. Yashin Ocean House is a real find. Prices: About £40 to £75 a head, excludes drinks and service.